This is my mother's recipe, and is still one of my favorites. It can be made days before serving it, there for making it a good make ahead recipe. What I like is that it can be easily double, tripled or quadrupled as you need. Bring oil, vinegar, sugar and salt to boil and cook until sugar is dissolved. Pour hot dressing over cabbage mixture and refrigerate until ready to use. It tastes best made at least 24 hours in advance and stays good for over a week. This recipe idea is from my sister in law. I'm thinking she does a much better job at this, she has made these rolls many times throughout the years. 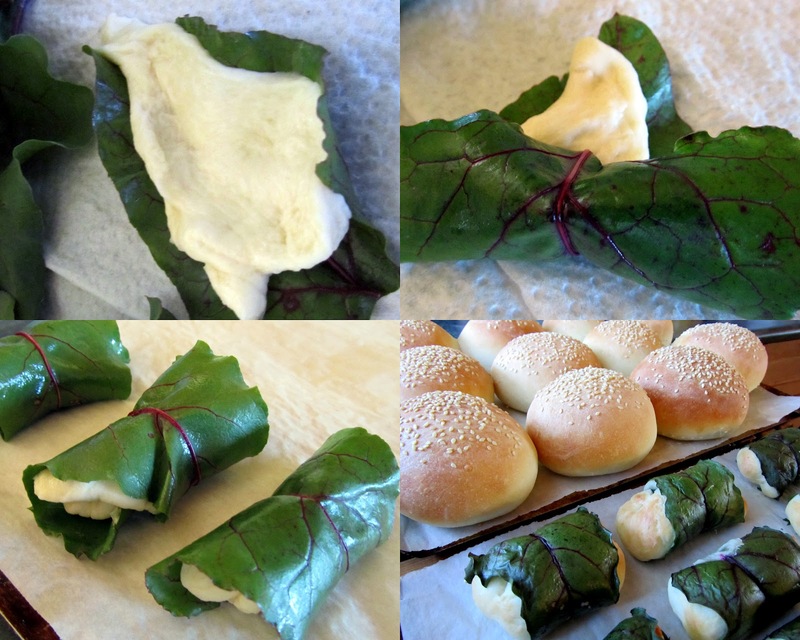 Our methods vary a bit but regardless we found these beet leaf wrapped rolls to be quite delicious served with a dill sauce. Next time you are mixing a batch of buns give this a try. You will have fresh buns and a dish prepared for supper. Beet leaves, washed, dried, and stems removed, using as many leaves as you want rolls. Once your bun dough has risen until double in bulk, pinch off small balls of dough. Stretching the dough to almost the size of the beet leaf, place dough on leaf and roll up loosely allowing for dough to expand. Leave ends open. Place approximately 2 inches apart on a parchment lined baking pan and allow to rise until doubled. Bake in a 375º oven for 25 minutes or until exposed buns are golden in color and feel firm. To serve, dip warm rolls in dill sauce. Or if you prefer pour sauce over rolls as they are baking. In a saucepan over medium heat, melt butter, add flour and whisk till well combined. Add cream, whisking constantly till it comes to a boil. Cook till thickened, stirring frequently. Stir in dill, garlic powder, salt and pepper. I always keep some Whole Wheat Pannini Flatbread in my freezer for those days when supper needs to be on the table in a rush. 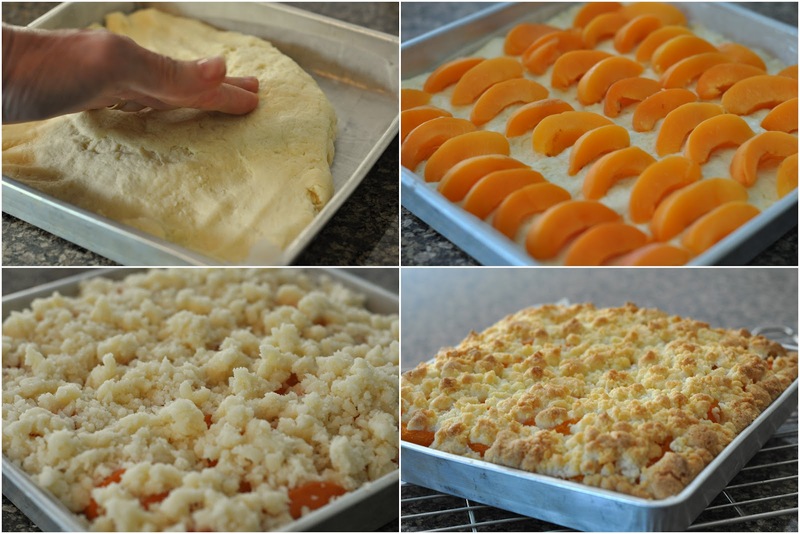 It is fully baked so it only needs to be crisped and heated through. With this pizza, I fry the toppings together while the oven or grill is preheating. While the pizza is in the oven, I scrub some carrots from the garden and slice some cucumbers for everyone to munch on while the pizza is baking. To speed up dinner preparations even more... prepare sausage and veggies in the morning and refrigerate them until later in the day when you are ready to put your pizza together. Preheat the oven or the grill to 400. Scramble fry the sausage, and drain well on paper towels. Using a paper towel, wipe the pan of the excess fat and then add the sausage back to the pan and add the onion and fry until the onions have caramelized. Add the bell peppers and stir fry until the peppers are just tender. Spread pizza sauce on the pannini bread. Sprinkle with cheese and the toppings. To have a crisp bottom pizza, carefully put the pizza directly on the racks or grill. Blackberries are plentiful right now here in the Fraser Valley. This week on our way home from camping we pulled off onto a side road and picked berries. I had purchased some pretty bottles to use to put in a gift basket along with some jam and jelly. The rest I put into 250ml jars. This syrup is wonderful on pancakes, french toast and waffles, or over ice cream. This recipe will yield approximately 6-7 250ml jars of syrup. Place washed berries in a large heavy bottom pot. Add all other ingredients and stir well to combine. Let stand while getting jars ready. Remove lids from jars and place in a bowl. Pour boiling water into empty clean jars and over lids in bowl. Allow to sit while you make syrup, which will take about 10 minutes on the stove top. Place pot with berries over medium heat and stir constantly until mixture comes to a rolling boil. Turn to low and stir hard as mixture continues to bubble. Cook for one full minute after you turn it down. Don't walk away or stop stirring! Remove from heat. Pour berry mixture through a large fine hole sieve or cheesecloth with a large bowl underneath to catch the syrup. This will separate most seeds and pulp leaving you with a very hot runny looking syrup. Discard seeds. Empty boiling water from jars and immediately pour hot syrup into sterilized jars. Dry lids and tighten onto jars. Within and hour you will hear the lids popping as they are sealing. Once the jars are cooled lightly press down on each jar lid making sure the seal has taken. They should not make a popping noise when pressed down lightly. If they do keep those ones in the fridge and use first. 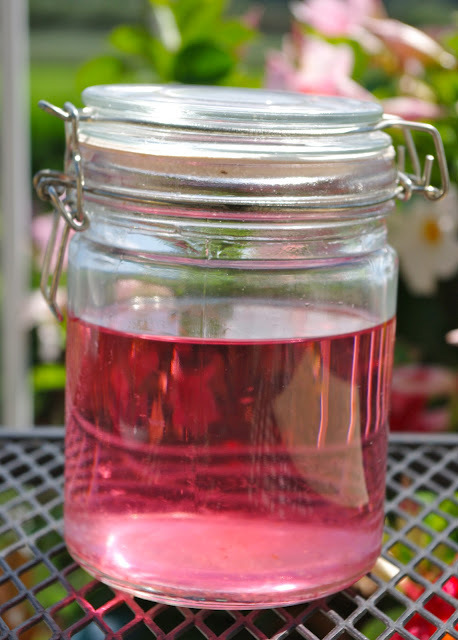 Allow to cool without tipping jars. Store in a cool dry place. Serve cold or heat slightly. 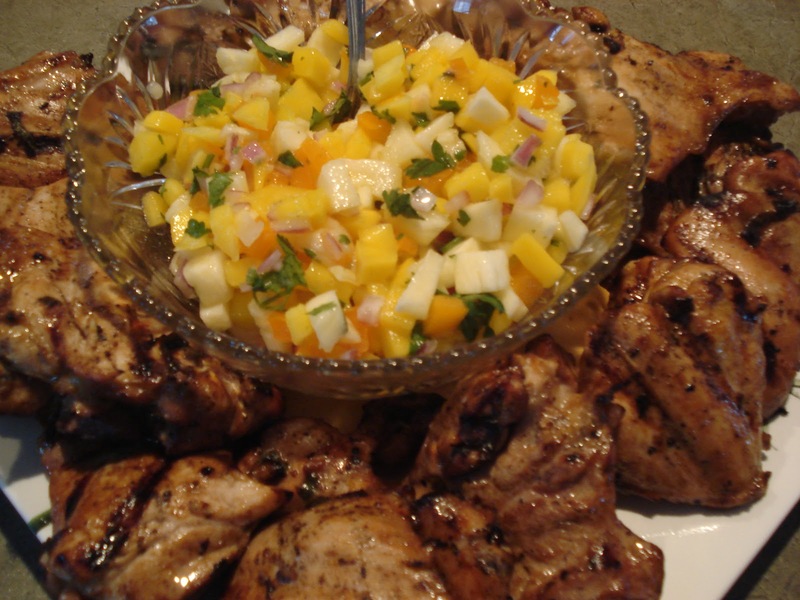 Are you looking for something different and refreshing to add to your appetizer menu on a hot summer's afternoon? Smoothies, served in small glasses are sure to be a hit. I chose to make them with blueberries but you could substitute any other kind of berry. I'm sure the children would love this for breakfast as well. Blend until berries are finely chopped, adding more milk if a thinner consistency is desired. Pour into glasses and serve immediately. (The banana will brown and dull the pretty blue colour). Another version of a Ranch Dressing Crockpot Chicken we tried recently that was very satisfying. Busy days are a great time to plug the crockpot in and step away for the day coming home to a nice meal. Prepare your crock with cooking spray. Pour salsa in bottom of crock. Layer chicken tenders on top of potatoes. Top with prepared ranch dressing. Cook on high for 1 hour and then turn down heat to low for 4-5 more hours. At end of cooking time stir the ingredients in the crock pot. of fresh vegetables in your fridge. Prepare the salad the night before you plan to serve it. although it is always the best the first day after you assemble it. 1-2 cups bottled vinaigrette dressing such as Italian, Creamy Italian, Roasted Red Pepper or Italian Parmesan. Or use your own favourite recipe. Vegetables: Use whatever vegetables you have on hand. Cutting them into uniform sized pieces will make the most attractive salad. Prepare vegetables, cutting them into uniform sized pieces and place them in a large bowl. Toss vegetables with your choice of vinaigrette dressing. I prefer some variety of Italian dressing. You can also use a homemade dressing but I find there are lots of good bottled dressings available. Use just enough to lightly coat all the veggies. You can adapt the amounts to the number of people you are serving. It is a very filling salad so count on 1/2 to 3/4 cup salad per person. We prepare the soil in the garden by tilling, then sowing the seeds and as they grow they will need watering and sunshine as well as weeding. If the weeds are allowed to grow they will take over the whole garden and all the good plants will not survive. We as Christians need to do this for our spiritual life. We need to be watchful, that we don't let the 'weeds' which are the character traits that are not of God, take over but rather keep 'watering and weeding' which is reading scriptures daily so we can grow in Him. We will harvest what we sow and nurture. Yesterday I walked past the garden on my way to the back of the field to pick blackberries. I clipped off some sunflowers and brought our lovely sunshine into the house. Oh how we love blackberry season when God, without the help of fertilizer or garden tools gives us juicy sweet blackberries to eat. I made the custard in the morning and when the grands came later in the day we churned up some delicious blackberry ice cream for our dessert. If you prefer to use whole milk or light cream instead of the buttermilk, go ahead but you will already have buttermilk in the refrigerator from Judy's biscuits and the buttermilk adds a slight tang that makes home made ice cream delicious. Wash the blackberries and drain and place in a small saucepan with half the sugar. Turn on medium high heat and bring to simmer and stir occasionally for 5 minutes. Put a sieve directly over the mouth of a blender jar and strain the blackberry juice and as much pulp as you can squeeze out with a wooden spoon into the blender jar. In another medium sized saucepan put the remaining sugar, the egg yolks and the whipping cream. Whisk constantly over medium heat until the mixture just begins simmer and the custard coats the back of a spoon. Add the buttermilk and continue to stir an additional minute. Using an Ice Cream maker freeze the blackberry custard according to manufactures instructions. Do you need something to go with all those summertime salads? While on a recent road trip we enjoyed dinner at the same restaurant on several occasions. Each time we were served a basket of delicious hot-from-the-oven garlic cheese biscuits. 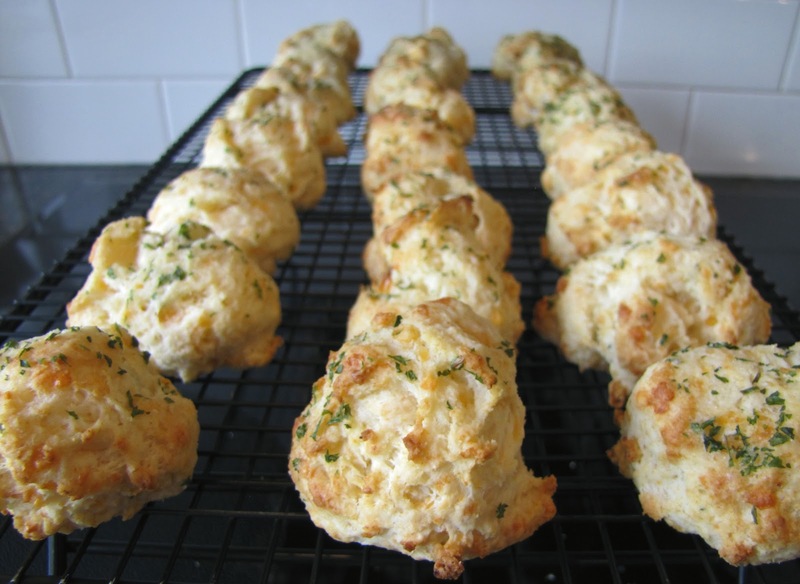 I tweaked my biscuit recipe somewhat and came up with these mini garlic biscuits. Serve fresh...and then freeze any leftover biscuits to accompany another meal. In a large bowl, combine flour, baking powder, baking soda, salt and sugar. Grate cold butter and combine evenly with flour mixture. Combine buttermilk and egg; stir into flour mixture. Work with hands to form soft dough. Drop by spoonfuls (rounded tablespoon)on a large parchment paper lined cookie sheet. Bake at 400°F for about 10-12 minutes. Combine topping ingredients, and brush over hot biscuits. I used the Pampered Chef cookie scoop to form mounds. It works well! Chocolate pudding was one of my favorite desserts growing up. I thought about that recently and how my mom used to serve it in a little bowl . . . and we'd pour milk on top. After many years now, I had to try it. It's still good. In the meantime, in a small bowl or 4-cup measuring cup, mix dry ingredients, then stir in 1/4 cup milk to make a smooth paste. 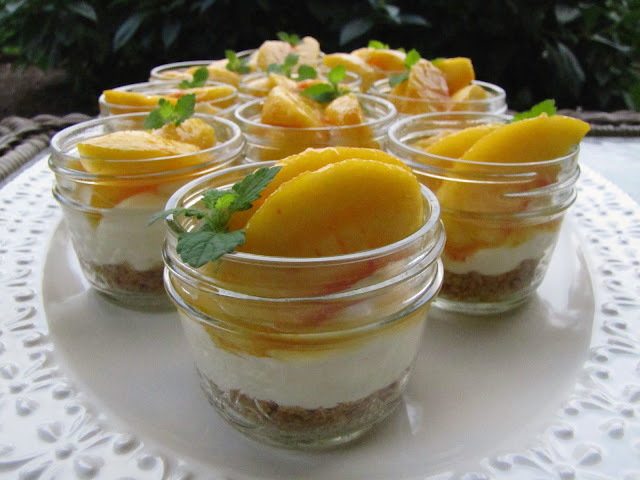 Pour into four ramekin dishes or individual dessert bowls, cover with saran wrap and allow to set and cool in fridge. PS For a milk chocolate taste, use Nestle Quick (chocolate drink mix), but for a dark chocolate taste, add some cocoa to the Nestle Quik and a bit more sugar if desired. This recipe can easily be altered according to taste. Hold it, before click away you just have to trust me on this one. I had these brownies the first time at my friend Linda's birthday party. She has been eating gluten free for over 28 years and all the desserts she made were gluten free and you would never know it. This chocolate brownie is so moist, dense and fudge like, with a delicious rich deep flavor of chocolate a hint of coconut and not to sweet, I just had to have the recipe. I like recipes that are naturally gluten free when we have people over who need to follow a gluten free diet, with out needing to buy all the different variety of flours and xanthum gum etc that you sometimes need to make gluten free cakes. I made this for our family and some friends, that don't need to follow a gluten free diet and they all liked it a lot as well as those who do need to eat gluten free. The bonus is a dessert that is healthy for you but doesn't taste like it is. This brownie gets an all around thumbs up! Grease a 9 " inch pan. Line with parchment paper. Place all the ingredients in a blender or food processor and blend until it is all liquid with no lumps. Bake in a preheated 350 degree oven for 25-30 minutes or until a toothpick inserted in the center comes out clean. (In my oven it took a full 35 minutes, so make sure to test your brownie). Serve with whip cream or ice cream if desired. This cake is suitable for gluten free, lactose intolerant diets. *vegetable oil can used in place of the coconut oil, but I like the hint of coconut flavor it gives the brownie. I didn't grow cucumbers in my garden this year but am thankful that my sister Norma's friend shared from her bountiful crop. I had been wanting to make pickles and with extra cucumbers on hand I finally mixed up a small batch of these crispy and sweet freezer pickles. An easy and tasty recipe and can easily be doubled. Thanks Esther for the recipe, as you will note I did change it up a bit. Stir salt into cucumber slices and mix well. Cover with ice and let sit for 3 hours in the fridge. Drain and rinse well with cold water, drain again. 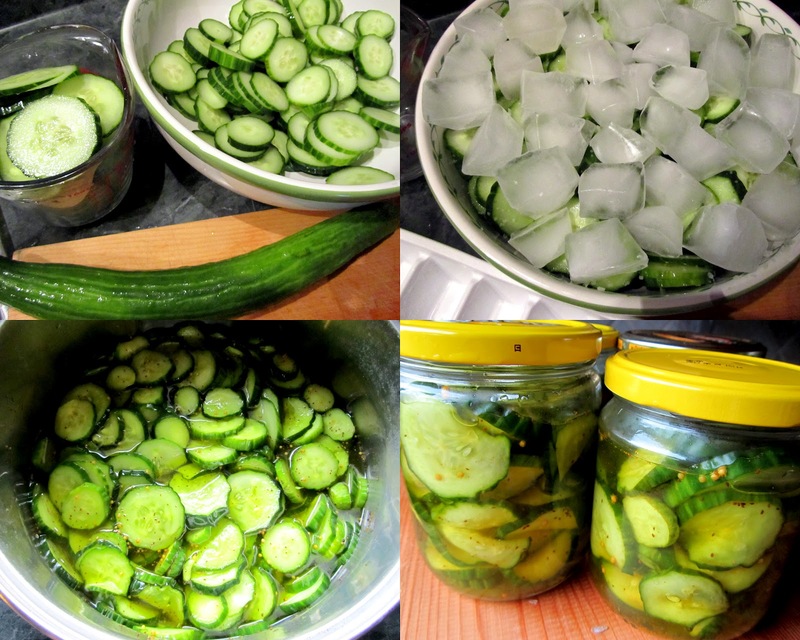 Remove from heat, add cucumbers and cool. Fill containers, leave 1/2" headspace. Place containers in freezer. For serving remove from freezer, let thaw and enjoy! Recently MGCC were invited to the ladies luncheon at the Canadian Mennonite Assembly. The song that follows, which was new to me, was sung during the program. Later I came across the verse from 2 Corinthians and was struck how Jesus used the images of seed, bread, vines and wine to teach us how He multiplies the blessings of these two elements. 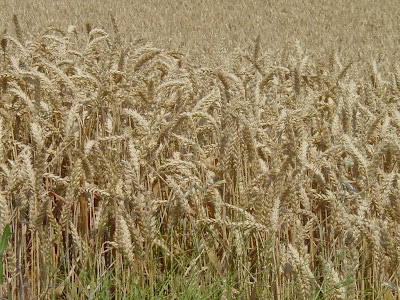 The seeds grow into wheat which is ground into flour that is baked into bread which feeds us. The vines flower and produce grapes that are crushed to quench our thirst. 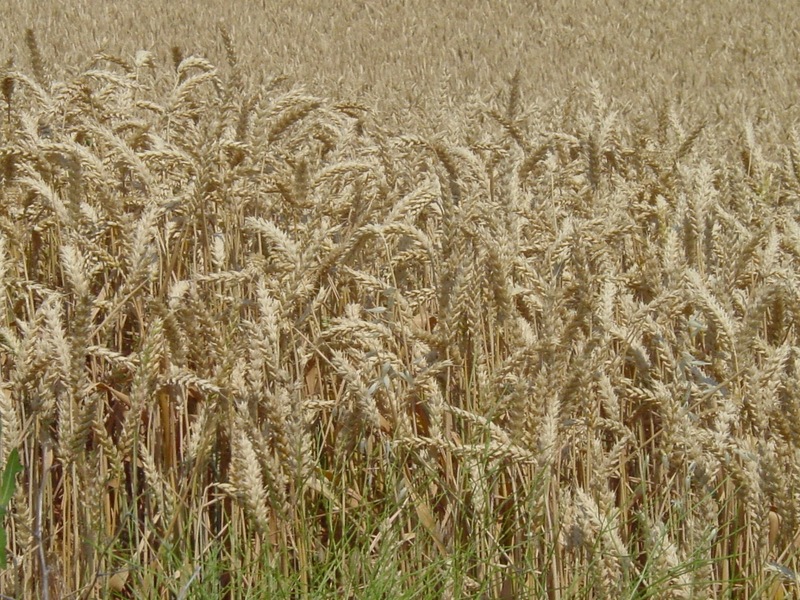 The wheat and grapes bring sustenance for physical life. Secondly, they are given to us as symbols of the great love God demonstrated in sending Christ to sacrifice His body and blood to cover our sins. These symbols bring us together - over a meal with a common purpose - to remember what He has done for us - providing both salvation from our sins and the promise of eternal life. Finally, the seed and the vines are a lesson in multiplication - of what God does when we spread the seed of God's word and share the fruit of the spirit. He takes our labour and turns it into a harvest of righteousness. May the words of this song touch your heart as they did mine. will flower and have life. This sweet and salty snack is hard to resist. The ingredients are few and the method is simple. This is also a Gluten Free recipe. Prepare a 15 x 10 sheet pan lightly greasing it. Distribute the corn chips evenly in the pan. In a medium sized pot cook the sugar and corn syrup until it bubbles and the sugar is completely dissolved. Take pot off stove top and blend in the peanut butter. Pour the blended sugar, corn syrup, peanut butter mixture over the corn chips evenly. Let it cool and enjoy! Summer's are for relaxing, enjoying long evening's and slowing down the hectic pace of life. BBQing and inviting people you love to share it with you is a good way to do it. This dish I first tasted in my cousin Kathy's home when I was visiting Ontario last summer. It really is a nice meal that involves little effort in the kitchen. Serve it with roasted potatoes a fresh salad, and of course a yummy rhubarb cake to finish off the meal. Mix the marinade ingredients together in a large resealable bag. Add the chicken and remove excess air, marinade over night. Discard marinade, and grill chicken on a lightly oiled grill for about 15 minutes on medium heat, until the chicken in cooked through and no pink, turning the chicken frequently to prevent burning. It has been rather warm here lately and we have been enjoying watermelon in salads, for dessert and even in our drinks. 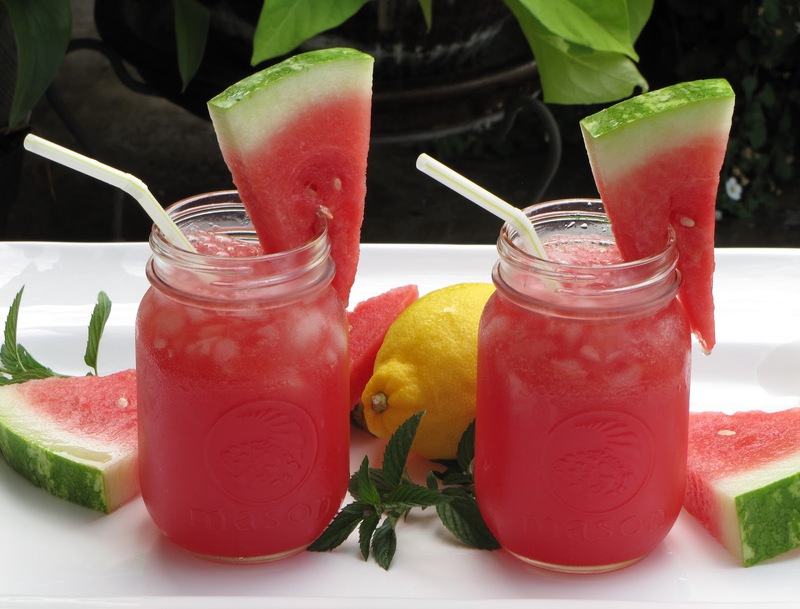 A nice cold glass of watermelon lemonade on a hot day is the perfect refresher! Yield: Two quarts of lemonade. I consider this a quick summer meal which is so fresh with all the summer produce and the light citrus dressing which ingredients are fairly common in our pantry and refrigerators. The drizzle is quickly combined and drizzled over it all. It combines your protein and salad all in one dish. Mix together all the vegetables in the slaw except the spring lettuce mix and set aside. Combine the white balsamic vinegar, olive oil, lemon juice, mustard, herbs and honey in a small bowl to create dressing. Whisk together to emulsify, and set aside. Heat a large non stick frypan over medium high heat. Season both sides of the halibut and add to the oil in the pan and sear on one side until golden brown and then turn over and add the vegetable broth. Cover and poach for an additional 5 minutes until the halibut flakes. Pour half of the Citrus Dressing over the Vegetable slaw and divide the slaw between 6 serving plates. Add ¼ cup poaching vegetable broth to the citrus drizzle. Place a piece of halibut over top the slaw and drizzle remaining citrus dressing/poaching liquid over the halibut. This is a recipe that is more for inspiration than detailed instructions, because you can use whatever vegetables you like and basically cooking time depends on the temperature of your grill and how well you like them done. I usually find that you can never make too much. Everyone gravitates toward the colorful display that is quite a random mix. I will try my best to remember this one. I did not add red onion in this one, but that would have been a good addition to the flavor. Chop up eggplant and cover in salted water for at least 1/2 hour, until ready to grill. Slice the rest of the vegetables and set aside until ready to grill. Drain egg plant and place in vegetable grilling basket to get a head start. Add to egg plant in grilling basket after about 5 - 10 minutes. Cook, stirring often, for about 20 - 30 minutes, adding sliced bok choy for final 5 minutes. Serve hot or room temperature. 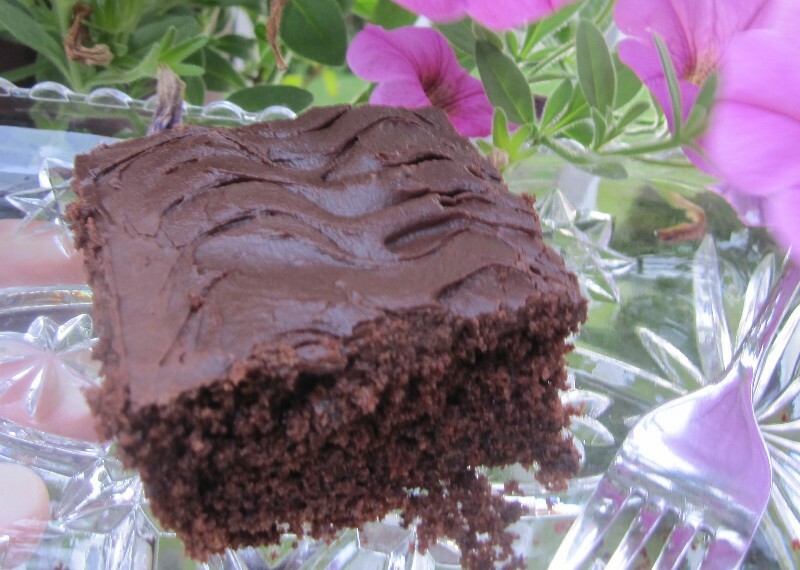 Bev's (MGCC) friend Dorothy passed on this Quinoa Brownie recipe to me that is delicious and considering the amazing nutritional value of Quinoa they are not just for those of us eating gluten-free ! Here is a link to a site itemizing the goodness of this seed. I will give you Dorothy's recipe as it was given to me and then give you my version because I prefer to use the flour rather than cooking the seed. The brownies are wonderfully light and fluffy and keep extremely well for several days - they would, of course also freeze well. Eat them plain or ice them. Bake as a sheet cake or in round layers.... however you prefer ! Bring quinoa and water to a boil. Cover and cook for 10 min. Turn off heat and leave on burner for 10 min. more. Fluff with a fork and cool. Combine liquids, add quinoa and butter and blend till smooth in blender . Whisk together dy ingredients and add to blender and mix well. Pour into 2 greased round pans or 1 larger one. Bake at 350 F. for 40-45 min. Serve as is , iced or as a base for a fruit-topped dessert. You'll never guess that these have no flour! Add dry ingredients to liquids and beat until perfectly smooth. Enjoy --- great with chocolate icing ! This is something my husband is always tempted to order at a restaurant for breakfast. I decided to make it at home and was surprised at how easy it is to do. 8 Homemade or Refrigerator Biscuits baked according to package instructions. 1 pkg. (approx. 1 pound) ground breakfast sausage. I used the hot variety. Prepare your biscuits and put them in the oven to bake. While biscuits are baking cook the sausage in a skillet until cooked thoroughly. Sprinkle flour over the sausage and stir in and cook for 2 minutes. Add 2 cups of milk all at once and cook stirring until the mixture thickens. Add the fresh parsley. Cut open a biscuit and place on plate. Cover the biscuit halves with the sausage gravy and serve while hot. Serves 4 with seconds on biscuits. Note: If you choose to use ground pork that isn't seasoned already add some sage, pepper and salt to the sausage to taste. When chives are in bloom, make chive vinegar. In two weeks you'll have a vinegar that adds great flavour to salad dressings. I especially enjoy the addition of this vinegar in my potato salad dressing. 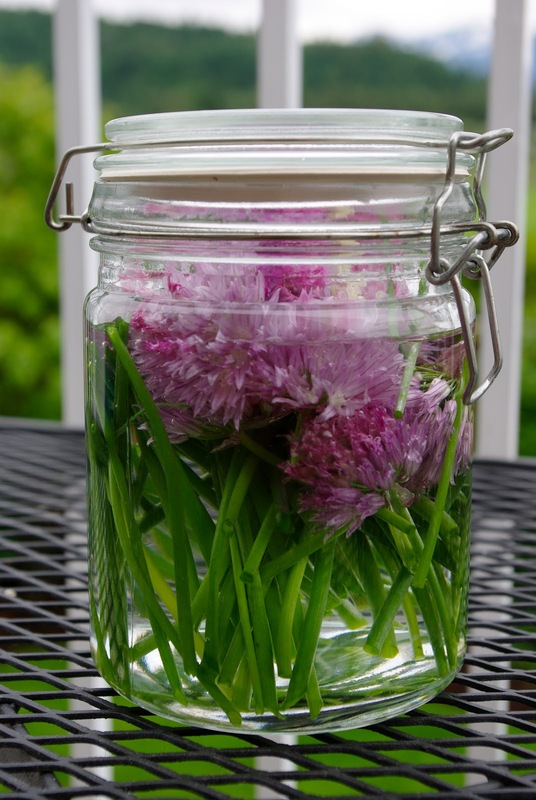 To begin, sterilize a glass jar, then go and pick a bouquet of chives in bloom. Wash chives well and air dry. Fill jar 3/4 full with white vinegar , and add the dry chives. Seal jar and place in a dark cool for 2 weeks. After 2 weeks the vinegar will be a nice soft pink. Using a cheese cloth strain the vinegar. Discard the chives and put the vinegar back into a clean jar. Store in a cool place. Chive vinegar has a stronger flavour so use it sparingly in place of regular vinegar in salad dressings and dip. I dropped in to visit my Aunt Lorena one day this week and she was mixing a casserole for a family birthday dinner that night. The recipe, that she had got from a friend, looked like something I would really enjoy. I leaned over the island counter to read her recipe card. She smiled and asked if I wanted to copy it . I give her recipe here as I copied it, then also give my Gluten-free variation. Bake for 45-60 min. at 350 degrees. Slice sausage thin, and pan fry in coconut oil for a few minutes. Drain fat from the sausage, then add the milk to the sausage in the pan and cook, stirring until thickened. 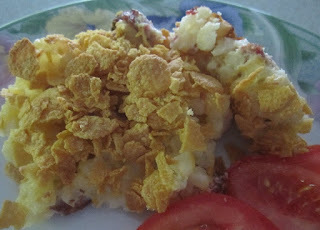 In large mixing bowl mix all the ingredients, adding the hash-browns last and spoon into buttered baking dish. Top with cornflakes and bake at 350 degrees for 45-60 minutes. Note - I was out of chicken breasts so I tried it with the sausage which we enjoyed - but it would also be good with chopped chicken breast instead of the sausage. Since this makes a large recipe I cooked half of it and froze the other half for another day.